How can WE contribute to a more 'just' and 'fair' FUTURE FOR ALL? Earlier in 2018 at Emmaus a group of senior students attended a Social Justice Workshop led by Caritas Australia. Caritas Australia is an international aid and development agency. Caritas Australia help end poverty, promote justice and uphold dignity so the world's poor won't need to rely on charity. The organisation delivers emergency relief and sustainable community development programs across Africa, Asia, Indigenous Australia, Latin America and the Pacific. You can find out more about Caritas Australia by clicking HERE. Six million primary aged students world wide are not attending school. Six million children in our world die before they reach 5 years of age. 40% of the world population do not have adequate sanitation. Seven hundred and ninety five million people suffer from malnutrition. 7% of the world population get to go to secondary school. Approximately 20% of the world population has no access to water at all. 10% of the world population overuse the world's resources. Sixty million people have been forced to leave their homes due to conflict. After being made aware that a 'JUST' future starts with EMPOWERMENT... COMMUNITY... CULTURE... EDUCATION... OPPORTUNITY and A SAFE PLACE TO LEARN, students left the workshop committed to making a difference. Four Emmaus mums along with their children are currently busy fundraising for the Tabitha Foundation Cambodia. The Foundation encourages volunteer house building teams to travel to Cambodia to build houses for Cambodians living in poverty. Without the safety of a home and clean water, many children will never make it to school. How can you support the efforts of these wonderfully selfless members of our school community? The group need to raise $16,000 by July 2019, which is when they will travel over to Cambodia to build 10 houses (includes a well for each house). The building team consists of Danielle McCann and her daughter Morgan, Siobhan Gosney and her daughter Milla, Sarah Lamanna and her son Jack and Maryanne McKenzie and her son Hugh. You can follow their journey and keep up to date on their fundraising events and ways you can show your support by following their Facebook or instagram page 'Ballarat Mums and their Teens building homes for Cambodians in need', or if you see them at school have a chat with them about their exciting Cambodian build mission. For those of you who are not familiar with this smiling face, her name is Ailish Ryan. She is a member of Mok - borreeyn and is in Grade 4. Recently Ailish witnessed homelessness in Melbourne while visiting with her parents, Alan and Narelle and brother Oliver. She saw people sleeping on the sides of the road and in the streets. When she saw these scenes Ailish shared that she felt so sad and that she wanted to be able to help. This was not just a thought that as a young person Ailish had at the time and then forgot about soon after. Ailish returned to Ballarat and immediately put her thinking cap on. Ailish has a goal to deliver 300 letters, cards and / or drawings in total to both the Shower Bus and the Soup Bus. She is requesting children and adults choose to participate. Title your letter / card / drawing… ‘Dear friend…’ and write whatever it is that your heart and mind desires. It has also been suggested that when signing your entry that you do so using your christian name only. You are invited to place your letter, card and / or drawing in the yellow letter box made by Ailish’s dad that you can find in our Social Justice space inside the main school entrance. Ailish will continue counting until 300 entries have been collected before delivering them to the Shower Bus and the Soup Bus for those in our community who will benefit from some of Ailish’s ‘sunshine’ and some of the Emmaus Catholic Primary School community ‘sunshine’ too. Eureka Mums is a voluntary network in Ballarat supporting families. Eureka mums recycle nursery equipment like cots, prams, and car seats, as well as clothes and other baby essentials. They collect donations of nursery equipment and other baby essentials like prams, clothes and linen from the public and sort, quality check, and safety check them to ensure they meet current Australian safety standards. Eureka Mums receive requests from local welfare agencies and maternal child health nurses on behalf of families in need. They then try to meet or exceed each request with quality new or pre-loved donations. Eureka Mums give to people who are facing a variety of challenges and hope they feel uplifted when they receive a donation. Eureka Mums Operational Manager is Trinsa Lewis, an existing Emmaus parent. We are again offering families the opportunity to support those who are unable to afford to keep their children warm this winter. 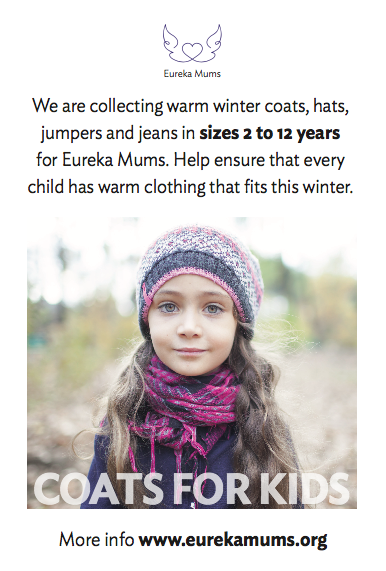 As a school community we are collecting warm winter coats, hats, jumpers and jeans in sizes 2 to 12 years for Eureka Mums. If you are able to support this campaign, please leave your donations (freshly washed) in the basket in our Social Justice Space. You can also follow Eureka mums on either Instagram or Facebook. Can you support the Uniting Care Book Fair in Ballarat this November? Books are sorted all year and volunteers are needed year round. If you would like to contribute to this initiative call 5332 1286. All funds raised are able to be utilised towards Uniting Care’s non-government funded programs such as the BreezeWay Meals Program and homeless support services. If you have books that as a family you are able to donate, please do so at your convenience.